This site is designed to be a resource for anyone interested in guitars and other fretted instruments. Learn about guitars and guitar repair from a player and luthier's perspective based on twenty years of repairing, building and restoring guitars and over thirty years of playing and performing. Most of this website is designed to be informative with lots of content to read through. You can now find items up for sale on my Reverb Shop page on my new "Store" section of the website. Scroll below the picture for links to different sections of this site or use the navigation along the top of the website. Luthier Brian Boedigheimer has been professionally performing guitar repair work since 1994. Acoustic guitar set-up, electric guitar set-up, nut replacement, saddle replacement, bridge re-glue, guitar electronics, electric guitar wiring, fret dress, re-fret jobs, tube amp electronics, custom guitar mods and more. 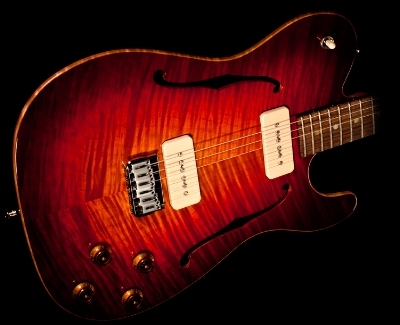 Learn about the handmade guitars built by luthier Brian Boedigheimer. Since 1994 guitar repair, restoration and custom guitar building has been a part of his professional life. Each step of building a guitar is performed by one person and one person only. Boedigheimer Instruments are made by a player for the player. These pages reflect the many projects that will be available for sale as I have time to work on them. If you see something that is of interest feel free to contact me with any questions. I can certainly put any specific guitar or amp to the head of the queue so it's ready for a new home. If you have repair related questions or would like advice on a particular instrument don't hesitate to contact me. The contact form is used by this website to reduce incoming spam. Any information provided will never be shared with another company or entity of any kind.